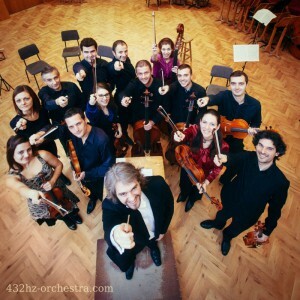 Presenting: The 432 Hz Orchestra! The professionally t rained, young conductor Yanakiev came to enjoy the “sacred sound” when he accidentally asked a “gifted cellist” to pitch his instrument on 432 hz instead of the usual 440hz. After the cello had been tuned to the new sound, the cellist began to play the Prelude of the Orchestral Suite No. 1 in G by Bach. The revelation was so influential to Yanakiev that he founded the 432 Hz Orchestra in November 2013. A group with 12 strings, which include some of the best violinists in the world. So far they have recorded two albums. Currently they are trying to raise money for a European tour. They have own homepage and you can find them on Facebook. Yanakiev is an enthusiastic member of a global movement of musicians who firmly believe that 432 hz sounds more “natural and true” than the standardized 440 Hz-pitch of Western music. One of the main representatives of the 432hz world is the Scottish producer and musician Brian T. Collins. He runs the page Omega432 â„¢, which discusses all facets of the frequency. For 33 years he has been dealing with the question of why this particular frequency is the best you can use. When Yanakiev founded his 432 orchestra, Collins was his consultant.